We had a couple of unexpected visitors on our second morning camping in Pembrokeshire. First up was a Fox which ambled into our field, sniffed a post, then promptly left. Emma got great views but as I was deeply ensconced within my sleeping bag by the time I’d broken free it was far too late. No such issues with our second guest however which we were able to watch for some time as it hopped its way ever so slowly towards us. 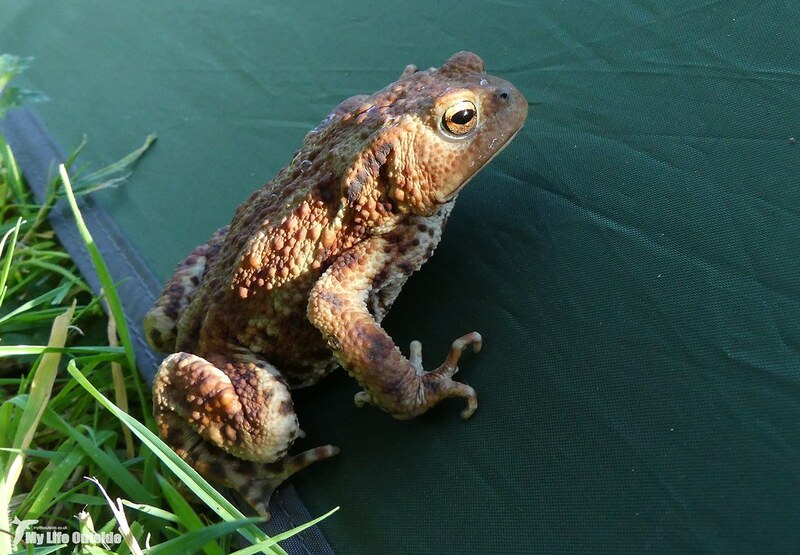 Quite where this Toad was heading is anyone’s guess but I carefully moved it into some nearby long grass where it would be safe as we broke camp. Car packed our day started on a very familiar note as we headed back over to St Justinian’s and set about walking the coast path. This time though we chose to head left along Ramsey Sound, the views far more expansive than yesterday although mist could still be seen hanging out on the horizon. This was very good news indeed as with a couple of boat trips planned for later in the day we wanted conditions as calm and clear as possible. As before butterfly numbers were very impressive but again very few settled long enough for photos. 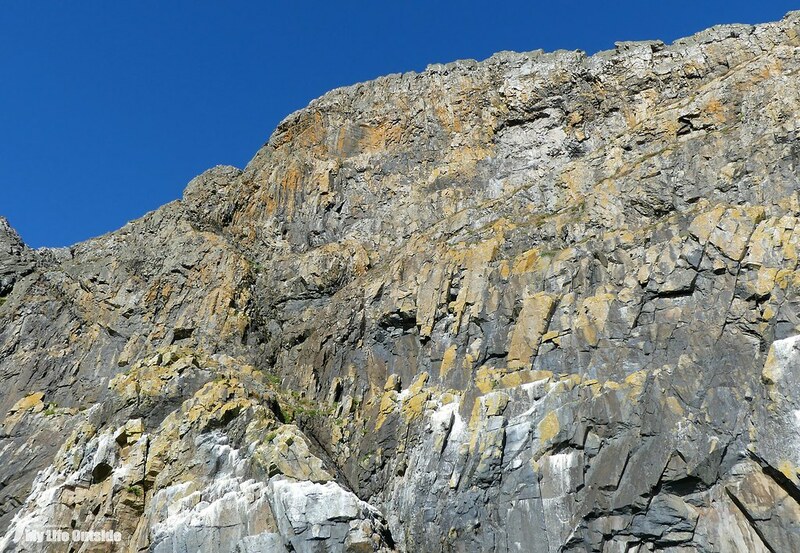 Birds too were numerous including a family of young Choughs, Ravens and a male Whitethroat blasting its song out from a radio mast near the new RNLI lifeboat station. Out in the Sound a couple of Kittiwakes were passing through closely followed by small groups of Gannets, juveniles included. 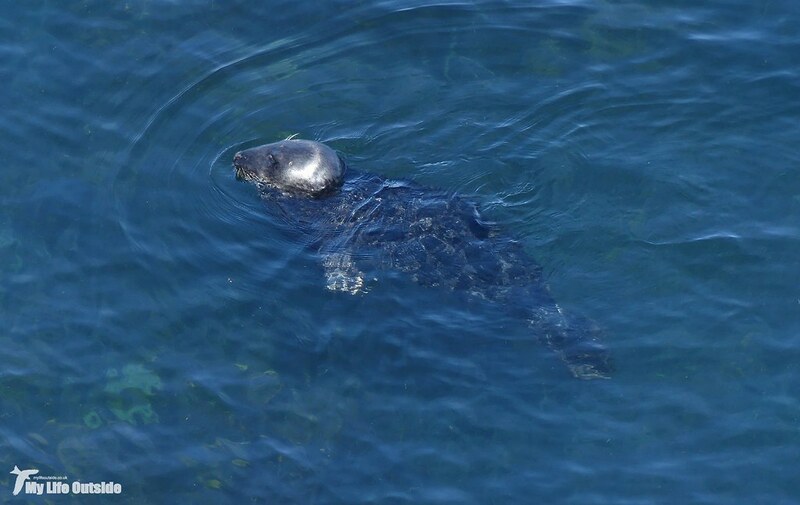 All very nice but in the sweltering heat I couldn’t help but think that this Grey Seal had the right idea lounging away the day in the cool water. What we were really after though were Harbour Porpoise and it didn’t take long to spot our first of what turned out to be six individuals feeding in the tide race. 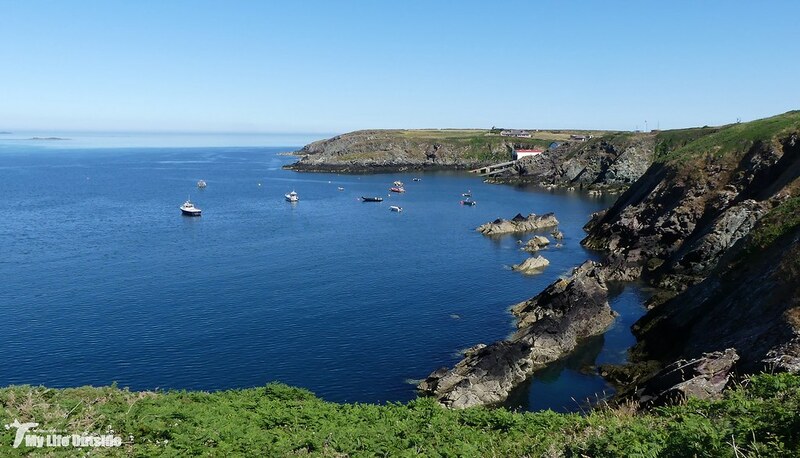 They’re an almost constant fixture here and we enjoyed brilliant and prolonged views until the tide turned and they vanished north towards Fishguard. 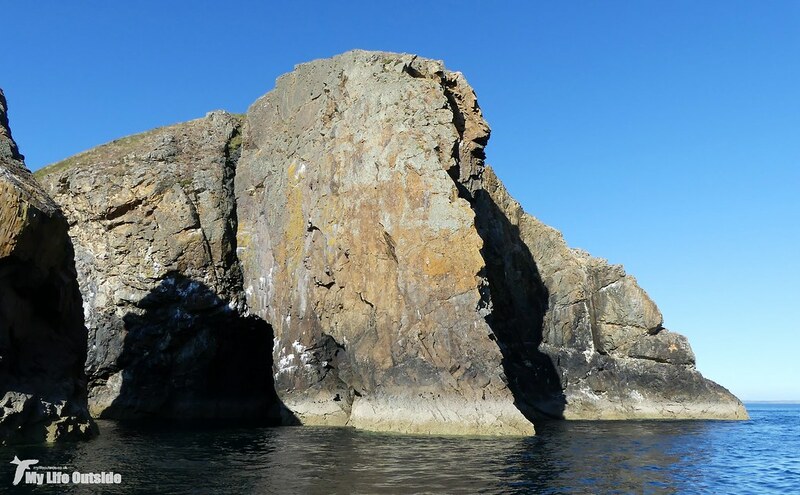 Excellent all but in reality just the preamble as today was always going to be about the boat trips and our first cast off just after three, the island of Grassholm our next port of call. 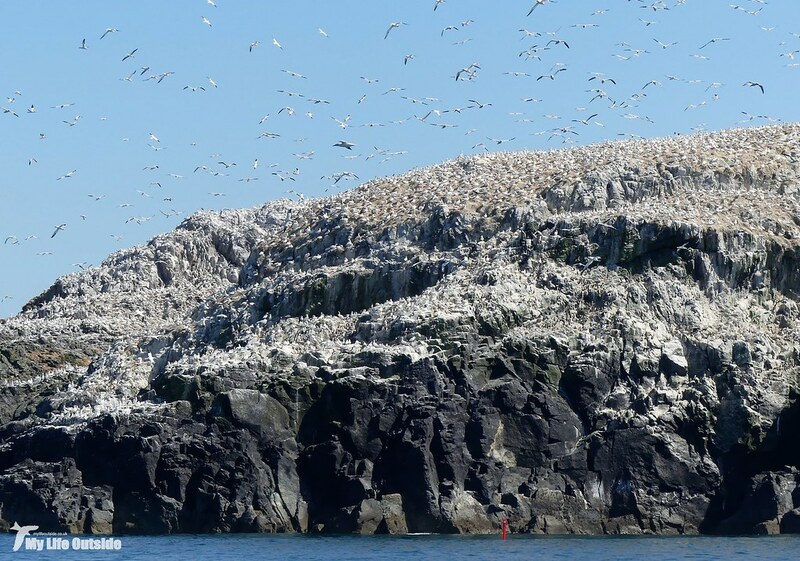 Home to over a hundred thousand Gannets its white mass is clearly visible from shore even across a distance of several miles. 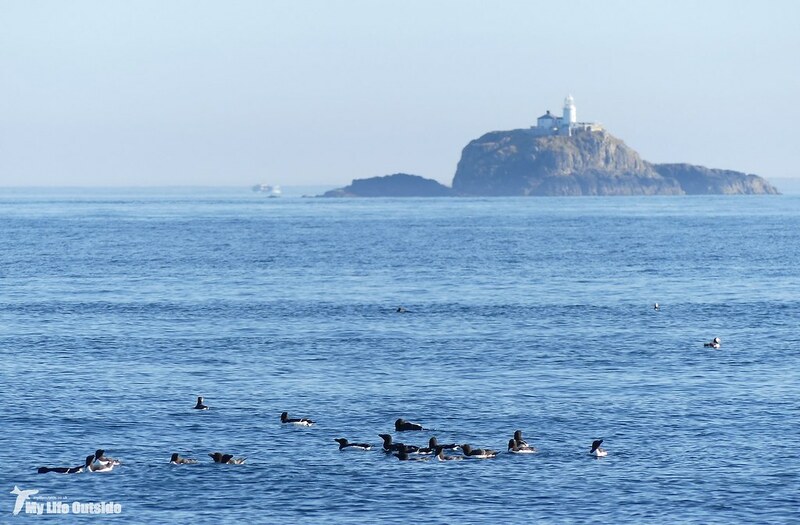 Our jet boat made short work of the strong currents as we drew inextricably closer, Puffins, Razorbills and Guillemots a constant companion. 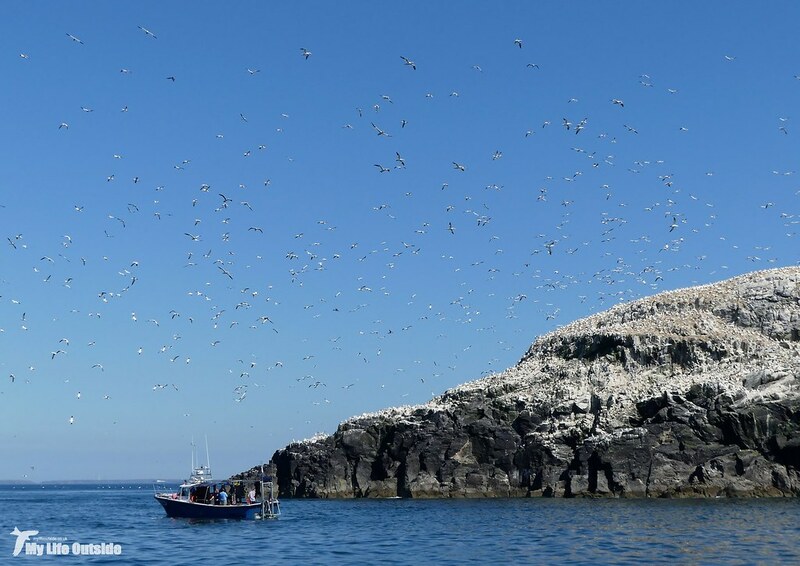 The Puffins in particular were a very welcome sight indeed as not only were they our first of the year but many were returning to Skomer beaks stuffed full of fish. That can only bode well for the colony there which continues to go from strength to strength whilst others, particularly in the north of the country, struggle. 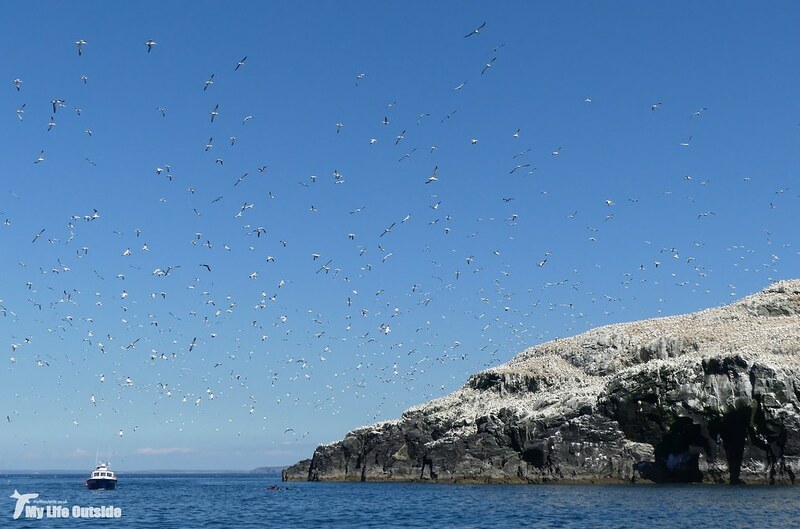 We must have still been over a mile out when we first caught sight of the cloud of birds circling above Grassholm. There were thousands of them, more than I've ever seen at any one time, their activities focussed on this small rock off the west coast of Wales. 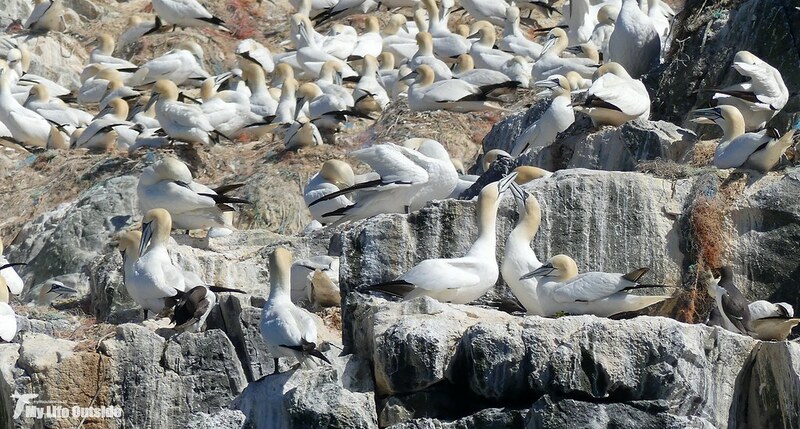 The closer we got the more birds there were until all around us was Gannets. 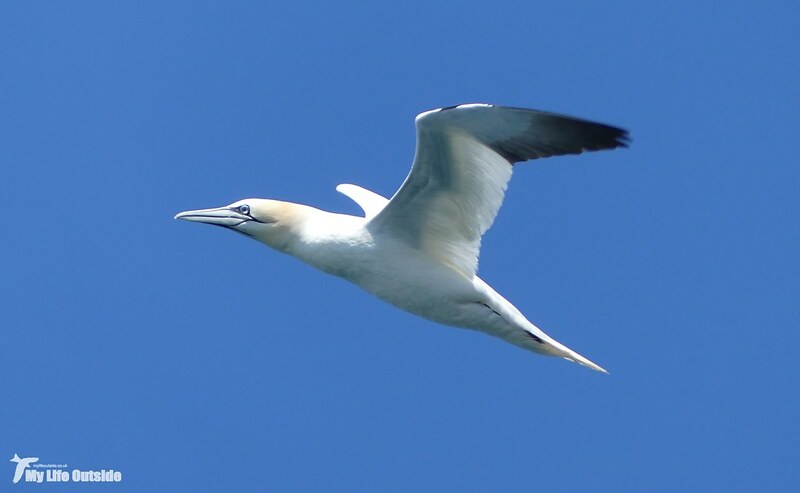 Overhead, sat on nests, diving for fish - a concentration of life so unfamiliar to these shores. I truthfully didn't know how to take it all in, where to look next or indeed what to look at. A natural spectacle so stupendous that I could never adequately portray in words what it felt like to be there, sounds and indeed smells which photos simply cannot portray. Amongst this mass of life I wanted to try and pick out individuals or moments that would otherwise have been lost if only looking at the bigger picture. No easy task but one with which I had a modicum of success. It really is hard not to understate what a truly fabulous experience this was. 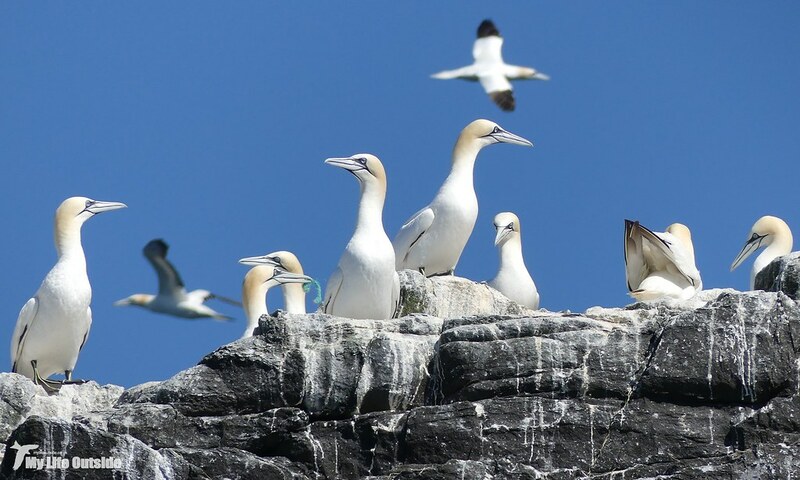 Gannets being such big birds undoubtedly helped but together with the weather and location it's going to be an experience that lives long and bright in my memories. 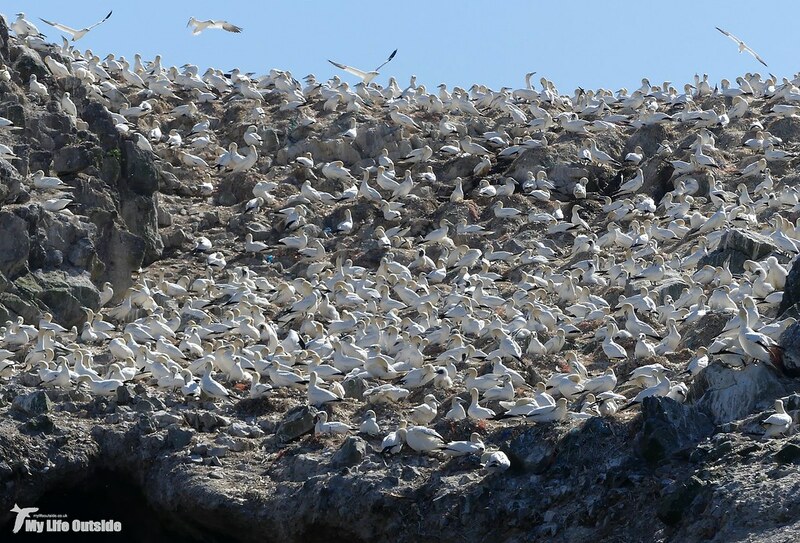 If there was one tiny fly in the ointment it was the sheer quantity of rubbish present within the Gannet nests. Most of this is discarded fishing net and rope and you don't need to look too hard in my photos above to find it. 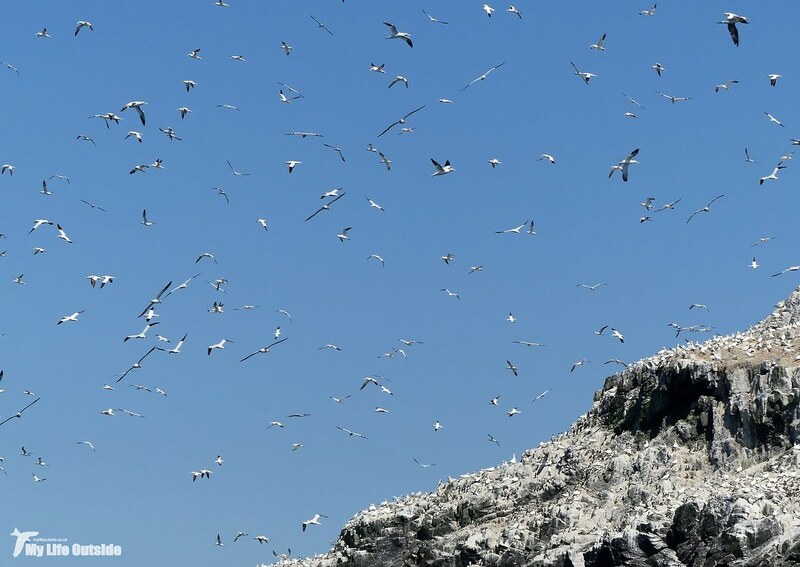 Estimates by the RSPB put the quantity of plastic waste on the island at around nineteen tonnes, a shocking figure and one which continues to grow year by year. If ever there was a stark example of what we're doing to our oceans, then this is it. When we finally pulled away from the island it was a real wrench but there was more excitement to be had just around the corner. 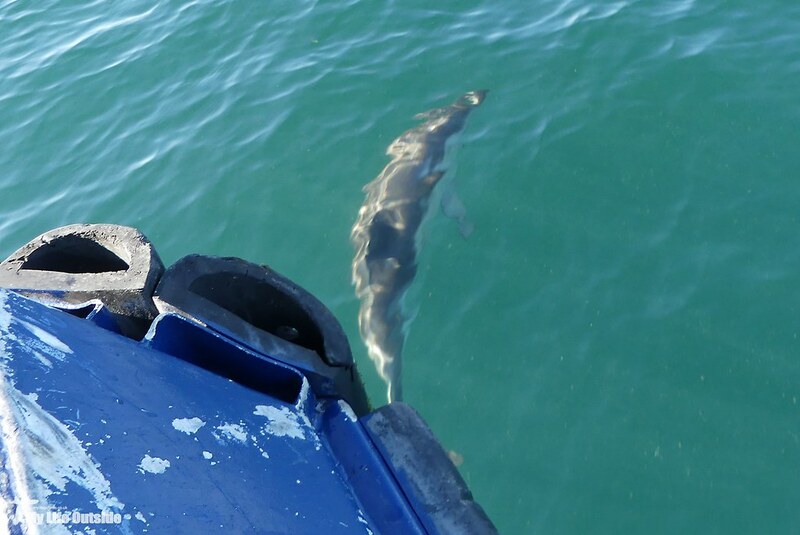 This was after all billed as a whale and dolphin cruise and up until now the best we'd seen was a lone Harbour Porpoise. 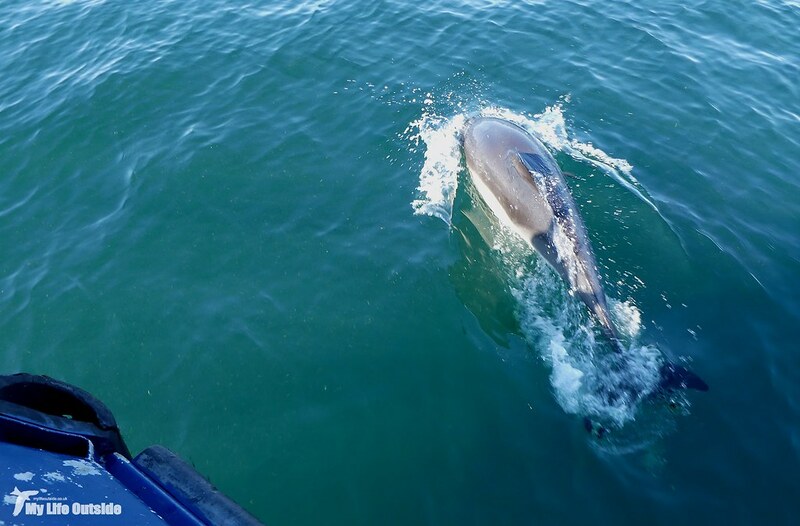 In fact we feared that was about as good as it was going to get until somewhere off South Bishop a trio of Common Dolphins appeared as if out of nowhere. Within moments they were riding our bow and we enjoyed jaw dropping views as one after another they'd swim up, breach and then peel away to be replaced immediately with the next. Due to their relatively small size we reckon these were probably youngsters but they thrilled to the max before shooting off almost as quickly as they'd arrived. Not bad at all but we still had a second trip to enjoy. 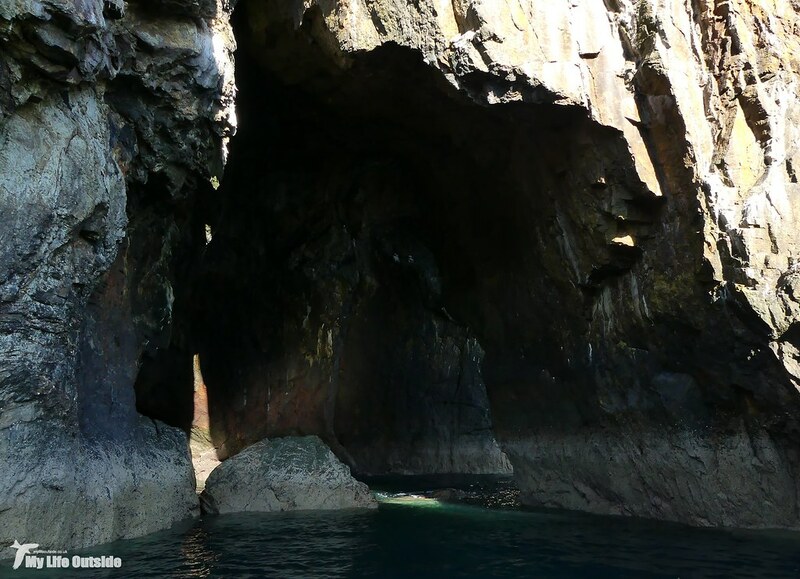 A quick change of boats and we were soon exploring the rocky cliffs and inlets of Ramsey island. In the late afternoon sun the lighting was superb and the sea almost mirror smooth. 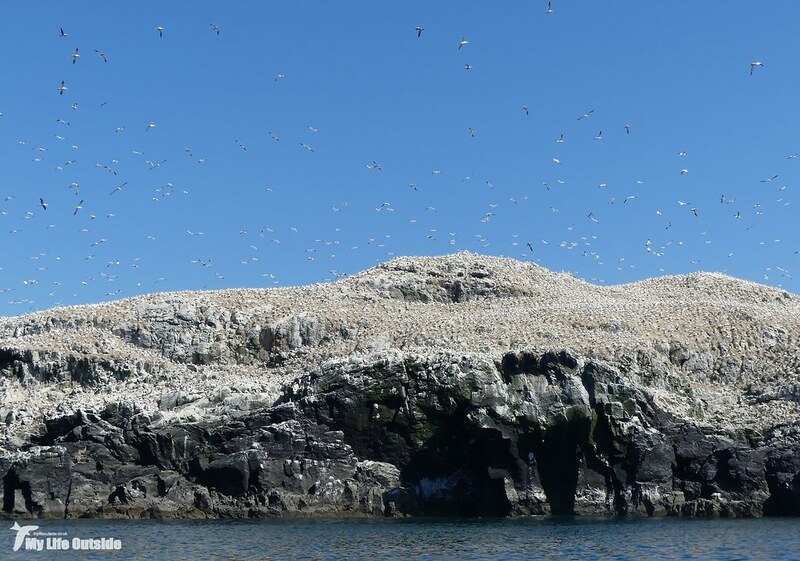 From there we headed further out to Carreg Rhoson where a small colony of Puffins breeds as well as being home to numerous Grey Seals. 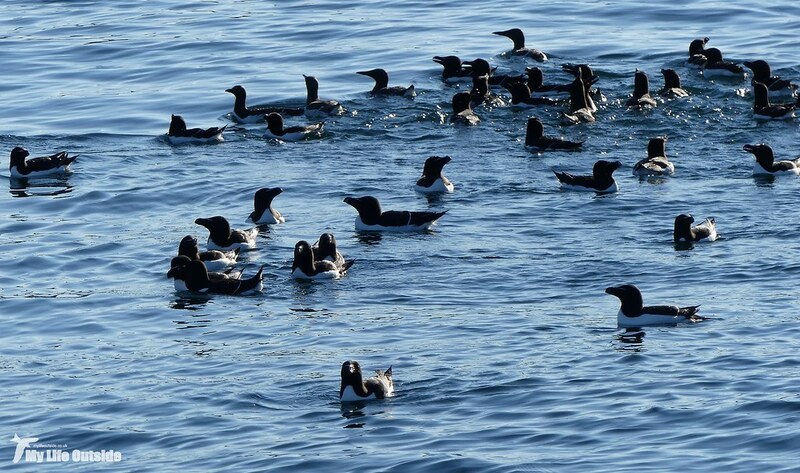 There were more Razorbills and Guillemots too although being an area infrequently visited all were quite wary and hard to get close to. 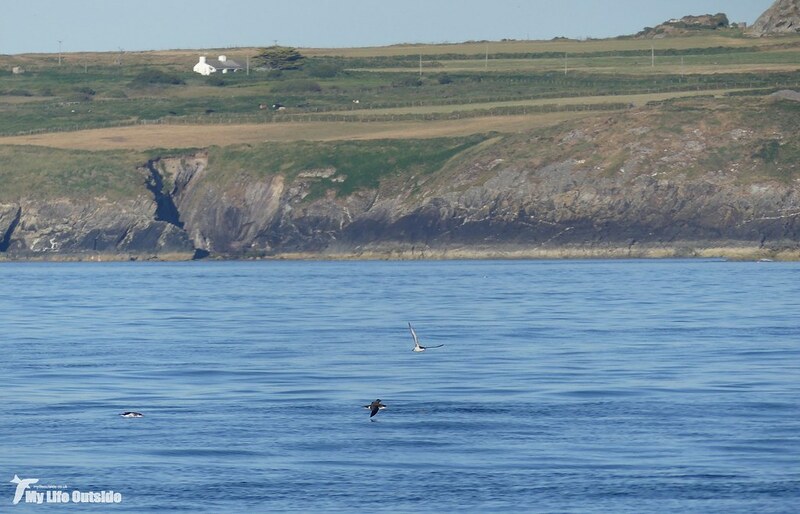 As the evening progressed the late shift began to appear in the shape of Manx Shearwaters. By ones and twos initially there were soon small groups then long lines but truthfully we could have done with another hour or so on the water to see the real masses streaming through. 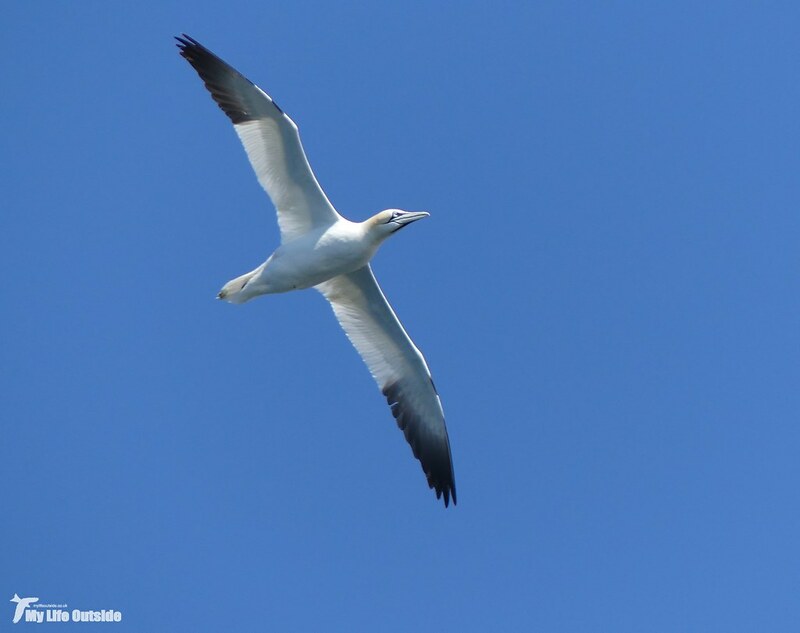 Being particularly clumsy birds on land they're incredibly vulnerable to predation so spend the day out at sea fishing only to return under the cover of darkness. 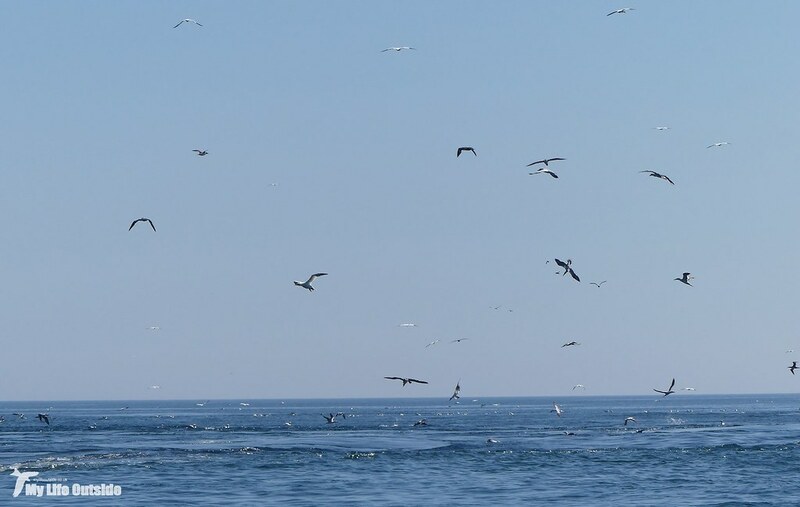 Even so we got some brilliant views of these Swifts of the sea, although it has to be said that my photographic efforts leave a little to be desired. By the time we made landfall for the final time I was shattered but oh so happy. Don't you just find it amazing that we have all of this going on along our coast and it's possible to see much of it across a single weekend? Pembrokeshire, you've been epic. 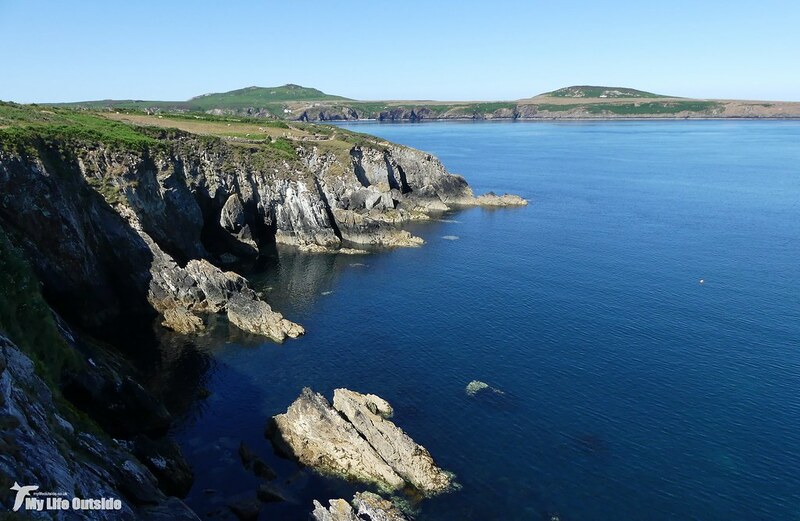 I love west Wales, so beautiful! I did that boat trip a few years ago, no dolphins on my go around though.